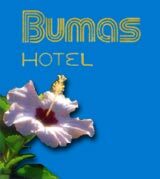 Bumas Hotel is located on Jalan Bumi Ayu 4, Sanur, only 10 minutes from the Ngurah Rai International Airport, 200 metres from Sanur Beach and 10 minutes from Denpasar Business and shopping district. The village of Sanur has resisted the change seen in other areas of Bali and remains steeped in an atmosphere of tradition and culture, enjoying a life style little altered by time. Here family and staff delight in sharing their way of life and traditional Balinese hospitality. Internet rates are nett, already included: Airport Hotel transfer if staying more than one night, daily breakfast, tax & service charge. Family plan: No charge for a maximum of two children under 12 years sharing same room with parents. A single rates applies when occupying a separate room. Charge : quoted in US Dollars, Half day use 50% charged. Maximum until 7 pm. 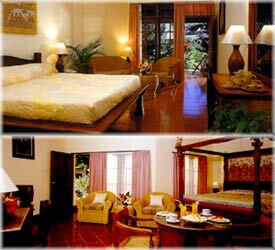 - both refreshingly large for a small hotel.